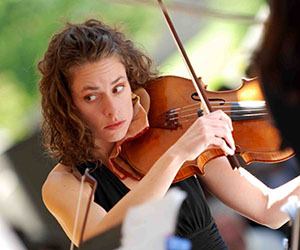 Dr. Caitlin Boyle, a Hamilton based violin and viola performer and pedagogue, began her musical training at the Hamilton Suzuki School when she was three years old. Since that time she has received subsequent training at the New England Conservatory, The Glenn Gould School, McGill University, and most recently at the University of Toronto where she researched nonverbal communication in chamber music for her doctoral thesis. A JUNO-nominated performing artist, Dr. Boyle concertized extensively for thirteen years with the Cecilia String Quartet. She has won several international awards including Banff, Bordeaux, and Osaka String Quartet Competitions. Currently a member of Sinfonia Toronto and the Niagara Symphony Orchestra, she has also performed and toured with orchestras such as the Munich Symphony Orchestra, the Schleswig-Holstein Orchestral Academy, and the National Youth Orchestra of Canada. Her passion for music education has led her to teach at the Faculty of Music at the University of Toronto, Mooredale Youth Orchestras, Cardinal Carter Academy for the Arts, Taylor Academy at the Royal Conservatory of Music, Festival of the Sound Music Scores Program, Toronto District School Board, Central Okanagan School District, in addition to teaching students across the US, Spain, UK, Italy, and the UAE. Dr. Boyle also co-founded Xenia Concerts, events tailored for and welcoming of families living with autism.